Do you thirst for that delicious spicy flavor? 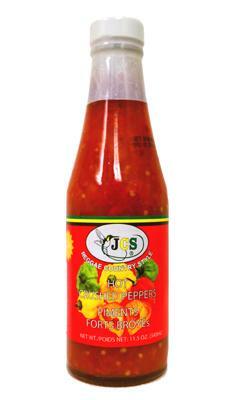 Our big 6 oz bottle of delicious Jamaican Country Style hot pepper sauce is for you! When you’re opening a bottle of JCS Hot Pepper Sauce, you’ll be immersed in the scent of the freshest hot peppers, and your taste buds will dance with its bold and fiery essence. Each bottle of our amazing JCS Hot Pepper Sauce contains the perfect balance between heat and delicious flavor. JCS Hot Pepper Sauce doesn't separate, and it doesn’t have that salt and vinegar flavor that a lot of other brands do. JCS Reggae Country Style award winning Hot Pepper Sauce has a rich and flavorful punch that will turn up the heat on your favorite meal.